Mitochondrial dysfunction was first described in the 1960s and since then medicine has advanced in its understanding of the role mitochondria play in health, disease, and aging. A wide range of seemingly unrelated disorders, such as schizophrenia, bipolar disease, dementia, Alzheimer’s disease, epilepsy, migraine headaches, strokes, neuropathic pain, Parkinson’s disease, ataxia, transient ischemic attack, cardiomyopathy, coronary artery disease, chronic fatigue syndrome, fibromyalgia, retinitis pigmentosa, diabetes, hepatitis C, and primary biliary cirrhosis, have underlying pathophysiological mechanisms in common, namely reactive oxygen species (ROS) production, the accumulation of mitochondrial DNA (mtDNA) damage, resulting in mitochondrial dysfunction. In cell biology mitochondria are small organelles found inside most cells. There can be between several hundred up to 3000 inside each cell. Mitochondria are sometimes described as “cellular power plants” because one of its prominent rolls is to generate most of the cell’s supply of adenosine triphosphate (ATP) which is pure chemical energy our body relies upon to survive. 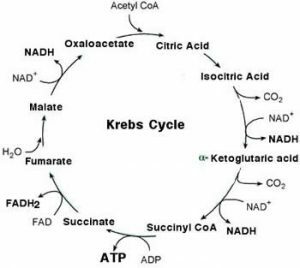 The central set of complex reactions involved in ATP production are collectively known as the citric acid cycle, or the Krebs Cycle. This cycle involves the process of a number of redox reactions of glucose, amino acids and fatty acids, obtained through our diet, through a chain of reactions to produce ATP. This process is dependent on the presence of oxygen. When oxygen is limited, the glycolytic products will be metabolized by anaerobic respiration, a process that is independent of the mitochondria and far less productive producing only a small fraction of ATP when compared to aerobic metabolism. This entire process is controlled by many factors such as electron transport, hormones, tropic factors, cytokines, neurotransmitters, cofactors and coenzymes. Mitochondria can be poisoned by numerous substances, including environmental toxins, heavy metals, excess iron (haemocromatosis), pesticides, chronic bacterial, viral and fungal infections and neurotoxins. These agents can induce excess production of reactive oxygen species such as superoxide, hydroxyl radicals, perioxynitrite, etc which cause the oxidation and thus damage of the mitochondria which in effect reduces their ability to produce energy. This oxidation is a common factor in a variety of diseases such as CFS, fibromyalgia, schizophrenia, bipolar disorder, dementia, Alzheimer’s disease, Parkinson’s disease, epilepsy, stroke, cardiovascular disease, retinitis pigmentosa, and diabetes mellitus. If there is a problem with the controlling mechanisms which regulate mitochondrial function then the whole process will suffer as a consequence. Certain hormones play a major roll regulating mitochondrial function. For example the thyroid hormone, T3, has a profound effect both indirectly through the activity of the nuclear receptor family on gene transcription, and directly on the impact on mitochondrial enzyme function. Growth hormone deficiencies will also reduce mitochondrial function, not to mention adrenal hormone deficiencies or imbalances also adversely affecting mitochondrial function. Therefore it is very important that these hormone levels are balanced and adequate in order to be able to regulate and maintain a healthy mitochondrial function. Nutritional deficiencies can also be responsible for a breakdown in mitochondrial function as the substrates and/or cofactors required for the citric acid cycle may not be present in sufficient quantities in order for the process to occur normally. High GI diets may also cause insulin resistance which also causes metabolic dysfunction. The intake of antioxidants is essential in order to prevent oxidative damage to the mitochondria caused by reactive oxygen species. Finally inflammation is another culprit. This may be the result of food allergies/intollerances, leaky gut, chronic disease, etc. Mitochondrial dysfunction can be tested for by doing a urinary organic acids test which can be arranged by us during a consultation. The first step in the treatment involves removing the offending agent such as infection or toxin. This could involve the use of medications or nutritional agents to kill off any infection whether it be bacterial, viral, parasitic or fungal. The elimination of various toxins through a detoxification process, including heavy metals, may also be required. The second step is to rectify any hormone deficiencies or imbalances such as thyroid and/or adrenal hormones which help regulate the citric acid cycle. Detailed information on these hormones is available throughout this website in the relevant sections. The third step involves dietary and lifestyle intervention in order to reduce oxidative stress. This involves eliminating dietary antigens which can trigger oxidative damage. It also involves changing the standard western diet which is poor in nutrients, calorie rich, has a high glycemic load, antioxidant deficient and refined which is responsible for increasing oxidative damage, not to mention dietary factors which increase inflammation such as deficient in essential fatty acids, high glycemic load, lack of fiber and saturated fats. In addition to diet exposure to environmental toxins, pollution, smoke, stress etc also need to be eliminated. The forth step involves supplementing the mitochondria with all the nutrients, substrates and cofactors required for the citric acid to occur. Antioxidants are also required to prevent further oxidation of the mitochondria. L-carnitine 250mg, lipoic acid 200mg, malic acid 1.2g, selenium 300mcg (as selenomethionine), magnesium 200mg (as citrate), 1g citrate (as magnesium), alpha keto glucarate 500mg, n-acetyl-cysteine 250mg, manganese 10mg (as gluconate), iron 10mg (as fumerate), fumerate 20mg, 50mg each of Vit B1, B2, B3,B5 and B6. This mitochondrial support powder is available through the members section of this website. Other supplements we recommend are 150mg CoEnzyme Q10 daily, glutathione 200mg daily and Ribose 3g daily. These are all also available in the members section of this website. Finally Nicotinamide riboside, a precurser to NAD+ production, is available which is essential for ATP production. Finally Pyrroloquinoline quinone (PQQ), a natural coenzyme found in many plants, fruits and vegetables, has been shown to stimulate mitochondria production in addition to protecting them from damage.